Humiseal 2C51 is a high solids, low viscosity, fast curing product. Humiseal 2C51 comes as a two-part kit. Part A and part B are mixed with a 1:1 ratio to either encapsulate or conformally coat your electronics. 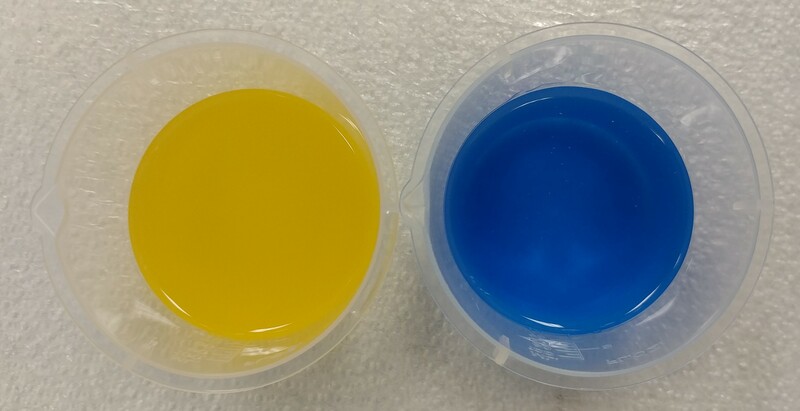 Part A and B are yellow and blue for easy verification of complete mix which is slightly turquoise. When cured, 2C51 is trasparent even in high thicknesses. 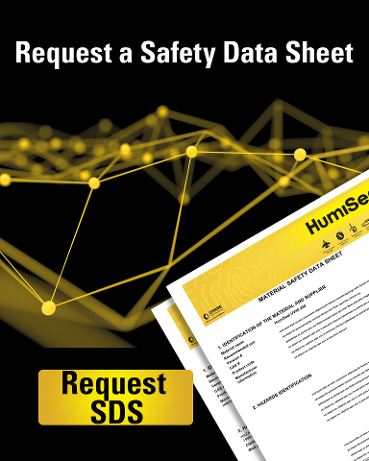 Humiseal 2C51 is primarily used in high temperature applications where component stress relief is required. When do I coat with a two-part silicone? 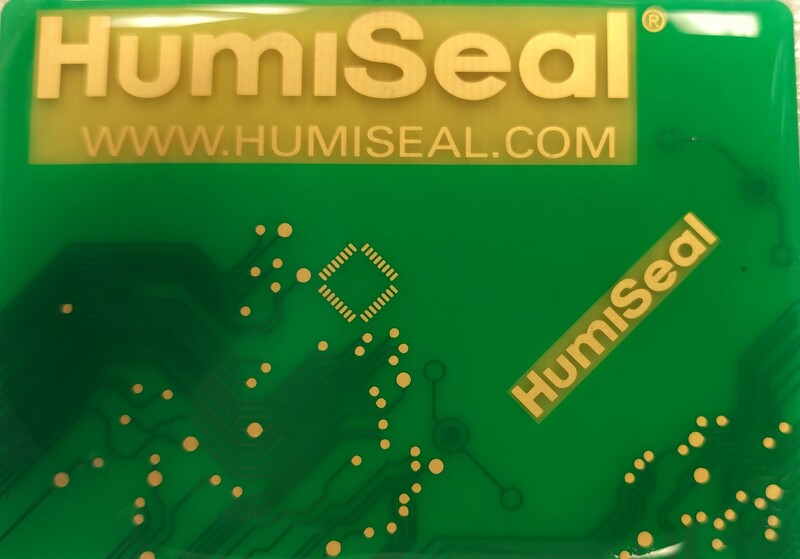 Humiseal 2C51 or other two-part silicones can be used as a conformal coating when a low thickness provides the adequate protection for your electronics. Coating thicknesses for a silicone typically range in the 5-10 mil range. Because silicones have a higher moisture vapor permeability (MVP) rate, you should perform adequate environmental testing to make certain the silicone coating is adequate for your application. Since a two-part silicone material cures through an autocatalytic reaction process, you do not have to worry about any outside variable like moisture or heat to help cure the coating. 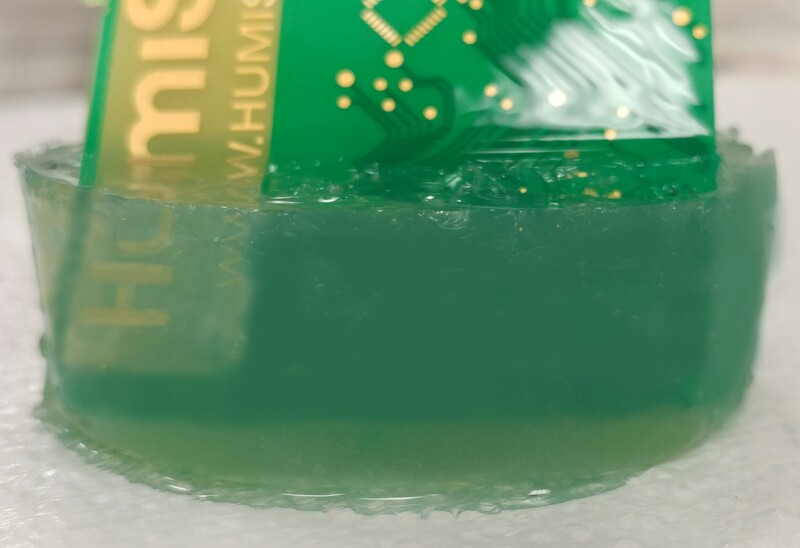 Using a two-part material or one-part conformal coating is usually preferred as it provides most of the benefits of potting, but also gives you a cost benefit and allows for a lighter and easier to inspect, test and repair. How do you spray a two-part silicone? Humiseal 2C51 can be sprayed using a variety of valves, we have tested a commercially available volumetric mix head which blends parts A and B at the spray head. The important thing to consider when spraying 2C51 or any two-part material is that the curing starts once mixed so a mixing at the spray head is recommended. When do I pot with 2C51? Potting with a two-part silicone should be considered when electronics require the added thickness to protect against harsh environmental conditions. Potting thicknesses are typically above ¼” and can range as high as 3-4 inches or thick enough to fill a cavity to completely encapsulate all your electronic components. Potting with a two-part silicone also provides resistance to shock and vibration. Potting with a two-part silicone should only be considered when absolutely necessary as it will increase the cost of your device and add weight to the component as well. There are many meter mix dispensing “MMD” machines out in the market, you should do your homework when choosing the right machine. Some of the things to consider are mix ratios, viscosities of the materials, work life of the mixed material and shot size. Two-part silicones are typically mixed through a static mixer attached at the end of the dispense valve. You should discuss the proper static mixer size with your MMD manufacturer to guarantee a complete mix of both material components. The 2C51 uses an autocatalytic reaction which starts immediately following the blending of part A and B. In either case, potting or conformal coating, the 2C51 will be ready for handling in about 10 minutes and fully cured after 60 minutes. Although the material does not need any acceleration for curing to take place, the 2C51 will reach its optimum properties faster with mild temperature increase. For example, at 70C, 2C51 will fully cure in 30 min. In summary, the 2C51 is a dual application material that can be used as a conformal coating or potting material. Fast curing properties make it ideal for medium-high production throughput without the need for elevated cure temperature. 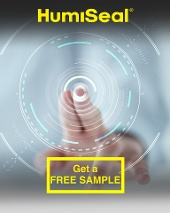 If you would like to discuss your specific application or learn more about the meter mix dispense "MMD" machine used to test 2C51, please contact us.